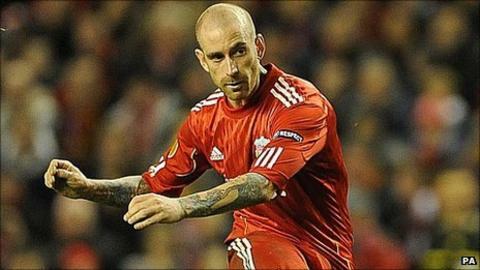 New Chelsea signing Raul Meireles has accused former club Liverpool of a broken promise and forcing him to submit a transfer request. The Portugal midfielder swapped Anfield for Stamford Bridge in a £12m deadline-day move, just a year after joining the Reds from FC Porto. And the 28-year-old explained: "All I have to say is I had one promise at Liverpool which wasn't fulfilled. "Liverpool asked me to hand in a transfer request, that's normal." Rumours have circulated that Liverpool promised Meireles a 100% pay rise if he impressed in his first season in the Premier League, a rise that was never forthcoming despite the playmaker making 35 appearances and scoring five goals. Meireles said upon signing for Chelsea that he had never wanted to leave Anfield and that he would eventually explain why he had done so. But even at his official Chelsea unveiling on Monday, the Portugal international was reluctant to reveal details. Referring to his claim of a broken promise, Meireles said: "It's not the only thing to blame. But that's why fans are unsure why I left." Refusing to discuss his relationship with Reds boss Kenny Dalglish, he added: "I was aware that Liverpool wanted to sell me in the summer, which was a bit surprising to me. "There's no point touching this subject any more. "I was a bit surprised, but now I'm just concentrating on my present and future, and that's with Chelsea." Meireles - who has been reunited with former Porto boss Andre Villas-Boas - was delighted to have ended up at Stamford Bridge, telling the press conference: "When Chelsea showed interest, it was like a golden opportunity. "I'm here now, it's a new adventure, and I want to do well here. "I worked under Andre for one month at Porto, so I felt that there's the same mentality here as there was at Porto - the desire to win competitions and trophies. With Andre, we can do that. "In one month, it was enough to see how he works and his desire to win things. So it wasn't hard to make the decision to come to Chelsea."